Legislation that seeks to better ensure the safety of students on college campuses by cracking down on hazing passed the House this week. Senate Bill 1090 is a comprehensive overhaul of the state’s anti-hazing law to give law enforcement better tools to prosecute hazing-related activities and to encourage those nearby to call for assistance for someone who may need help. Specifically, the bill would increase penalties for those involved in hazing; require schools to have policies and reporting procedures in place to stop hazing; and ensure that parents and students are provided with information related to the issue. The legislation also would establish clear parameters on hazing for fraternities and sororities. The legislation is named in memory of Tim Piazza, a Penn State student who died as a result of hazing in 2017 and was denied medical care for hours. The measure now heads back to the Senate for concurrence. To help ensure the state’s animal cruelty laws are enforced in the fairest way possible, legislation has been signed into law to strengthen the training and oversight of Humane Society police officers. Act 77 of 2018 increases initial and annual training hours for Humane Society police officers, and requires the training to include the proper procedure to file citations and warrants, including when and how to contact other law enforcement. Other provisions of the new law require training in farm operations and biosecurity, including at least one on-site visit to a working commercial farm operation. Any organization that employs Humane Society police officers will also be subject to the state’s Right-to-Know Law. Congratulations to these 29 men and women from Pennsylvania’s Special Olympics team who captured at least one medal during the national competition in Seattle in July. 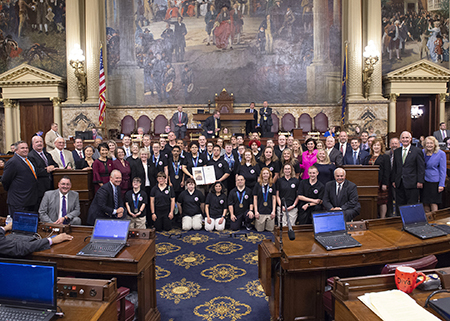 They made the trip to Harrisburg on Wednesday to be publicly recognized by the Pennsylvania House of Representative for their outstanding achievements. The Commonwealth of Pennsylvania’s General Fund revenue collections for September were $3.04 billion, which was $184 million more than the official estimate. So far this fiscal year, General Fund collections total $7.55 billion, which is $210 million, or 2.86 percent, above the official estimate. Learn more here. Three volunteer fire departments in the 86th District will benefit from a state program that funds equipment purchases and training to battle wildfires. Grants were awarded to Cumberland Valley Hose Company No. 2, Shippensburg ($5,000); Marysville Fire Company ($10,000); and Vigilant Hose Company No. 1, Shippensburg ($1,110). Local firefighting forces in communities with fewer than 10,000 residents qualify for the aid through the Department of Conservation and Natural Resources, which is used for purchasing mobile or portable radios; installing water supply equipment; wildfire prevention and mitigation work; training wildfire fighters; or converting and maintaining federal excess vehicles. The Office of State Fire Commissioner is urging residents to “look, listen and learn” as part of this year’s theme for Fire Prevention Week, which lasts through Saturday, Oct. 13. With today’s homes being filled with synthetic materials that burn hotter and faster, residents may have as little as two minutes to safely exit a burning structure. The theme focuses on three basic but essential ways to quickly and safely escape a home fire: Look for places fire could start; listen for the sound of the smoke alarm; and learn two ways out of every room. A home escape plan includes working smoke alarms on every level of the home, in every bedroom and near all sleeping areas. It also includes two ways out of every room, usually a door and a window, with a clear path to an outside meeting place that is a safe distance from the home. For additional information about Fire Prevention Week and home escape planning, visit www.firepreventionweek.org.